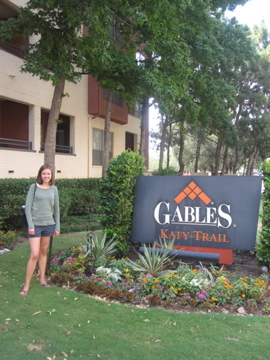 Apartment Number Two: The Split Level at Gables at the Katy Trail!! When it came down to it, I realized that having outdoor space was really important to me. That ruled out the big bright efficiency at Post Uptown Village even though it was right near the fun bar area. I didn’t want to feel holed up in my apartment. 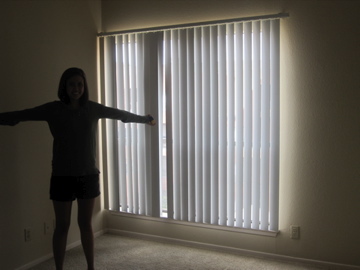 I really thought about the money saving between the tiny efficiency and this bigger split-level, and decided that the $100 extra was worth it to feel really comfortable and proud of where I was living. And here’s my bedroom!! It’s big enough for a full or queen bed with a nightstand and the dresser. And the closet has some shelves and different levels of hanging space built in. I LOVE IT! I’m so excited and relieved to finally know where I’m living. I can now start picking out furniture and really start to make this place my new home. What am I giving up? Well, I will have to pay to belong to a gym but I would have done that for any of the three. There isn’t a washer and dryer in the unit (the ONE thing I said I wanted! But none of the ones in my price range had that option!) It’s a few extra blocks to get to the main bars, but that’s alright. I love the direct access to the Katy Trail and that I can still easily get to the fun parts of Uptown. And yes it’s more expensive than I EVER thought I would pay for an apartment here, but I’ve learned that Dallas is just an expensive city! 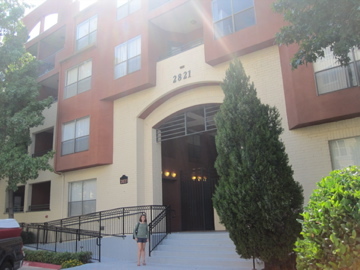 My salary can afford this space, so I’m going to make the most of my time in Dallas by living somewhere wonderful. oh my gosh your new apartment is so beautiful! I am so jealous!!! Your new home is too cute! I’m glad you picked #2, it was my favorite (not that my opinion counts :-)) Enjoy your new place! Great decision! I was just at Uptown a few weeks ago and there’s also a really cute restaurant called Breadwinners there that my friends love! Congrats! I was right 🙂 It looks like a awesome apartment and you will love it! I agree the outdoor space is key. YAY Congrats Clare! It looks great. It was my favorite of the three as well. Having a place that you’re comfortable in is SO important. I finally learned this after 3 apartments, sometimes an extra $50-$100 is worth it. Yay congrats!!! It looks awesome! Sometimes, a little extra money is totally worth it :). Hope you’re having so much fun in Dallas! Great decision! It looks really nice & the previous pool pic seems amazing! SO exciting!! My sister used to live there. 🙂 It’s pretty close to me & Billy. Probably just about 2 miles down the Katy Trail. Takes less than 10 minutes by bike. We’ll have to get together asap! I love it Clare, great choice!! Your apartment looks wonderful, Clare! After living for four years in Dallas, and most recently living in a house that was smack-dab in the middle of the Uptown bars, I can safely say that you will appreciate living a little further away from the bars than you had originally wanted. They are a lot of fun, of course, but (at least in my opinion) living in close proximity to them made it almost impossible to get away from the kind of people who spend all night, every night there. I think you’ll be really happy with your choice! Gables is in a nice, safe neighborhood, with a lot of young professionals, and lots of really fun restaurants! Have a super time in Dallas! Shucks! I was wrong! 😛 I love the pad though! Can’t wait to see how you personalize it with your decor! Dangit, I read about the winner before the other post! But I love the one you picked! That was so fun to do a house hunters type post. I love the kitchen and bathrooms 🙂 I can’t wait to see your adventures in Dallas! This is the one i guessed you would pick 🙂 Who cares about cooling the upper floor..you are always cold anyways!! Your apartment looks really nice! Congrats on finding where you are going to live! Aww so exciting! That’s the one I picked! We are hopefully deciding on an apartment tonight..I hope we get the one we want! Good luck, Clare. Enjoy Dallas and your new apartment. Yay! I was hoping that you would pick that one! It was my favorite! Have fun on your new adventure! Entering mom mode: Oh please don’t post details about where you live on a public blog. Please? Entering reader mode: Cute place, and what’s a few extra blocks to the bars? You burn off more calories walking home. Love it!! #2 was my fave!